As the plumule grows and develops into a stem of some length in the Stock or China Aster, it is seen to be self-supporting, because the thickness and woody matter in the interior is proportionate to the height. The leaves of the Cabbage are much larger, and the stem becomes greatly thickened to support them. The stem of the Gourd becomes enormously lengthened in proportion to its thickness, but has to lie on the ground unless supported. 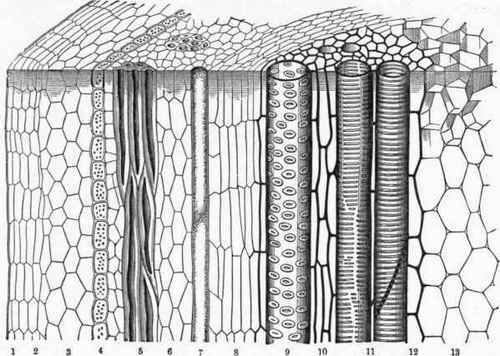 If the stem of any of these plants is cut across it will be found to have a core of pith, consisting of thin-walled cells, surrounded by a layer of wood of greater or less thickness, and that again by a bark of no great thickness, and covered on the outside with a skin or epidermis. Such stems of the first year are usually green, because they contain chlorophyll, and are capable of manufacturing plant food. The skin of green stems also has air pores, or 8tomata, such as leaves have, and takes in oxygen from the atmosphere for the purpose of breathing. The above, in general terms, is the structure of a stem of one season's growth. In order fully to understand the thickening of a stem it will be necessary to consider the structure of a shrub or tree, say the stem of an Apple tree of some size. If the stem is cut across, the pith (fig. 20) will be found in the centre, and probably of small size, owing to the pressure of wood upon it. This is surrounded by a number of layers of wood, each ring corresponding to one year's growth, and thus the age of the tree may be determined. This wood is made up of cells, wood fibres, and vessels more or less thickened internally. Surrounding the wood in winter is a thin layer of thin-walled cells, termed the cambium (No. 8), to be considered presently. Outside of the cambium is a ring or rind forming the bark, now of considerable thickness by comparison with that of a Stock or Gourd. It has lost its skin or epidermis (No. 1), and in place of the stomata, openings loosely filled with cork cells, and known as lenticels, may often be observed on stems or branches not too old. These are breathing pores. A large portion of the bark is made up of corky tissue (No. 2), gradually breaking away from year to year, while the inner portion is younger and more fibrous. Collectively the various members of the rind are known as bark. Some of the fibres are thickened, and known as hard bast (No. 5), while the inner cells remain thin-walled, constituting the soft bast (No. 6). Archangel mats are made from the hard bast of the younger portion of the bark of the Lime tree. Sieve tubes (No. 7) are included in the hard bast, which serves to give toughness and pliability to stems and branches. The bark, collectively, also serves to protect the cambium from injury and the wood from decay; hence one good reason for careful pruning and judicious lopping of all trees whatever. Fig. 20. - Portion cut from a Branch of a Leafy Tree x about 200 (diagrammatic). 1, Superficial coat (Epidermis). 2, Cork (Periderm). 3, Cortical parenchyma. 4, Vascular bundle sheath. 5, Hard bast. 6, Soft bast. 7, Sieve tubes. 8, Cambium. 9, Pitted vessel. 10, Wood parenchyma. 11, Scalariform vessels. 12, Medullary sheath. 13, Medulla or pith.